I’m really wishing I would have taken pictures of the weekend, but it slipped my mind until I was ready to make a new post! We had such a great weekend filled with laughs, a few tears and lots of time with friends. Saturday, I attended a baby shower for a really good friend of mine who has been such an inspiration in my life. I’m so happy that their daughter gets them as parents because I know she will grow up to be a strong, loving and faithful woman. As you may have guessed, that’s where the tears came in! I’m thankful to have been a part of their special day. We also visited some other close friends after the shower since we were in the area. Love seeing their little guy, and he has grown so much! I wish the time would slow down a little bit. He’s in his shy stage, but by the end of our visit, I was getting hugs and kisses. And the biggest news of the weekend, we became members of the church we’ve been attending! I’m so excited to have found such warm and welcoming environment to worship in. The minute we stepped into the church on our first visit, it felt like home to me, so I’m proud to say that it is finally home. The week ahead brings chores! I started some reconstruction on our flower bed, and it’s in need of many more hours of TLC that I hope to accomplish before we head out of town this weekend. Looking forward to seeing my family and visiting my granny! 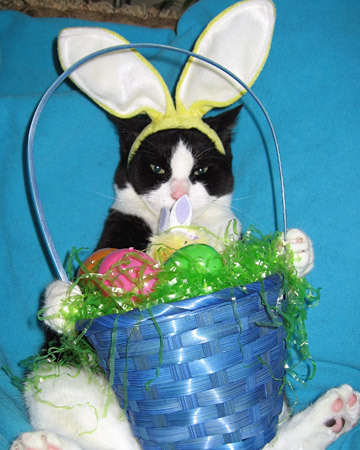 And since I didn’t have any pictures to share, I leave you with this cuteness: kitty in an Easter basket!